We didn’t have a proper Mother’s Day card to review last week (or all of last week), so I decided to make up for it today with Blight Mamba. Since jokes about yo’ mamba never get old, right? 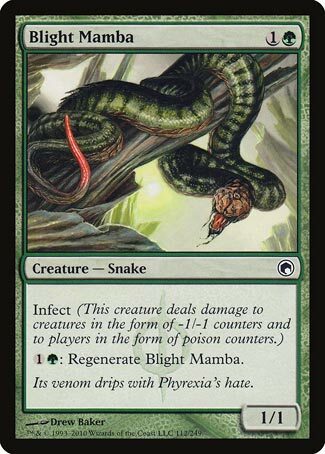 Anywho, Blight Mamba is another of the small creatures that might have a home in the standard Infect build; while two mana is hard to sometimes get on board (and is worse than Glistener Elf), the ability to regenerate can make the Mamba more resilient to removal on top of all the pump spells the deck runs. And as a reminder, infect means that you need to get to 10 poison instead of take your opponent to 0 life; this means that infect can explode, but it also can come up short if the explosion stalls. Blight Mamba is a weird creature that’s better in a longer game in spite of its bad stats. It’s rarely seen play for a while, but yo’ mamba proves that, when you rotate out of Standard, you rotate out of Standard. I always thought this card never quite got the recognition it deserved. It may not pass the “vanilla test” as such, and yet infect means that most decks have to block it but a lot can’t in a reasonable way, and some decks can’t even remove it because it regenerates. It turned out that infect decks at competitive levels went for speed, both in Standard and in Modern, but Blight Mamba is still a good choice in the slower kitchen-table styles of the archetype. Not only is he a good start to a strategy that leans on the proliferate ability, regeneration and permanent damage makes him a deceptively good blocker.